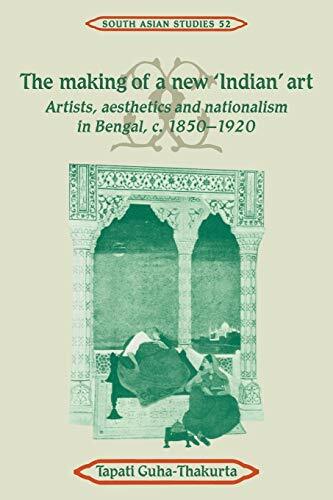 The Making of a New 'Indian' Art This book offers an analysis of the transformations that occurred in the art and aesthetic values of Bengal during the colonial and nationalist periods. This book offers a path-breaking analysis of the transformations that occurred in the art and aesthetic values of Bengal during the colonial and nationalist periods. Tapati Guha-Thakurta moves beyond most existing assumptions and narratives to explore the complexities and diversities of the changes generated by Western contacts and nationalist preoccupations in art. This book offers a path-breaking analysis of the transformations that occurred in the art and aesthetic values of Bengal during the colonial and nationalist periods. Tapati Guha-Thakurta moves beyond most existing assumptions and narratives to explore the complexities and diversities of the changes generated by Western contacts and nationalist preoccupations in art. She examines the shifts both in the forms and practices of painting as well as in the ideas and opinions about Indian art during the late nineteenth and early twentieth centuries. The author investigates the complex processes of westernisation of Calcutta's art world: the shifting status of artisans and artists, the emergence of new professional and commercial opportunities and the permeation of Western standards and techniques that both created a new Indian 'high art' and transformed popular commercial art. Against this background, she analyses the role and nature of nationalist ideology in art, tracing its changing priorities over the period and the multiplicity of attitudes and convictions about 'Indian' art. The study deals particularly with the ways in which a dominant nationalist discourse evolved in the Swadeshi period and was mobilised to the cause of a new movement. Led by the reformist art teacher, E. B. Havell, and the pioneer artist, Abanindranath Tagore, it staked its exclusive claim to artistic regeneration, the recovery of tradition and the creation of a new 'national art'. The author shows how the flourishing of an alternative 'Indian-style' painting was tied to the reconstruction of an Indian aesthetic, to a new vocabulary of art criticism and a new language of aesthetic discourse. These orientalist andnationalist formulations of Indian art, she argues, operated within a wider milieu of aesthetic self-awareness and a thriving middle-class art culture in Bengal. The making of a new 'Indian' art will be widely read by students and specialists of South Asian studies and art history as well as by Orientalists.